BT has revamped its Vision+ set top box, radically overhauling the chassis and controller and tinkering with the power consumption. The new set top box's overhaul means it's now available in black (compared to silver before) which matches the 'iconic' (according to BT) Home Hub wireless router. The controller will also be made iconic too, being encased in the same black as the box - but also features "enlarged characters to improve legibility in lower lighting conditions and for the visually impaired." Power consumption has been addressed as well, with the box now consuming 12 per cent less power when in use, despite being probably 25 per cent more iconic thanks to the new black chassis. 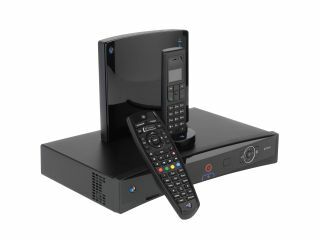 BT did say that a future Vision box will be able to receive Freeview HD channels, but TechRadar has spoken to the company and it has confirmed that this release will not be sporting the upgraded channel list, but a future update will still fulfil this promise. The service has been underperforming since its launch, with CEO Marc Watson stating that the service will not hit the three million subscribers targeted by 2010, but it's likely the company is looking to this new launch to help boost uptake of the service. If only BT can now find a way for the Vision+ box to stop recording Scrubs half way through for no good reason on a semi-regular basis then perhaps that too might entice customers to stop paying for another service instead.